Just off the living room is the dining portico, an elegant space for breakfast, lunch or candlelit dinners that can accommodate up to 20 people. 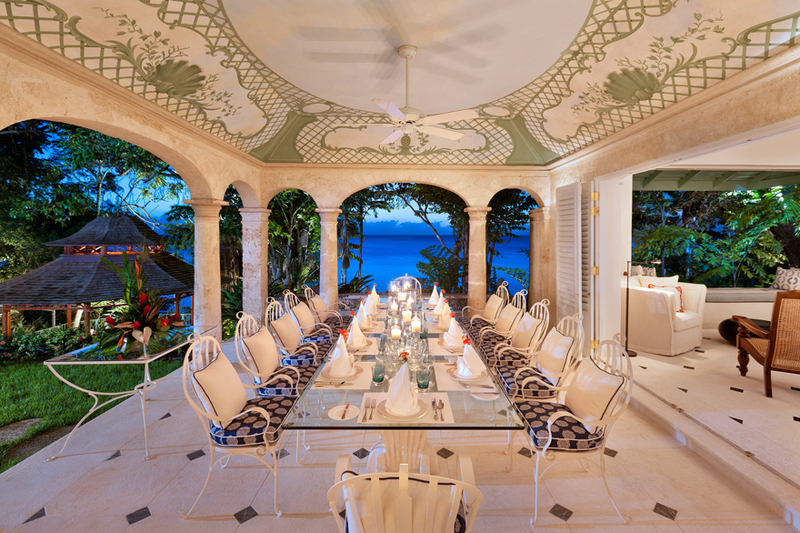 The coral stone porticoes offer breathtaking views of the gardens and Caribbean Sea; the portico’s trey ceiling is finished with a beautiful fresco done in a signature ‘Messel Green’ and white, featuring a shell and pineapple motif. 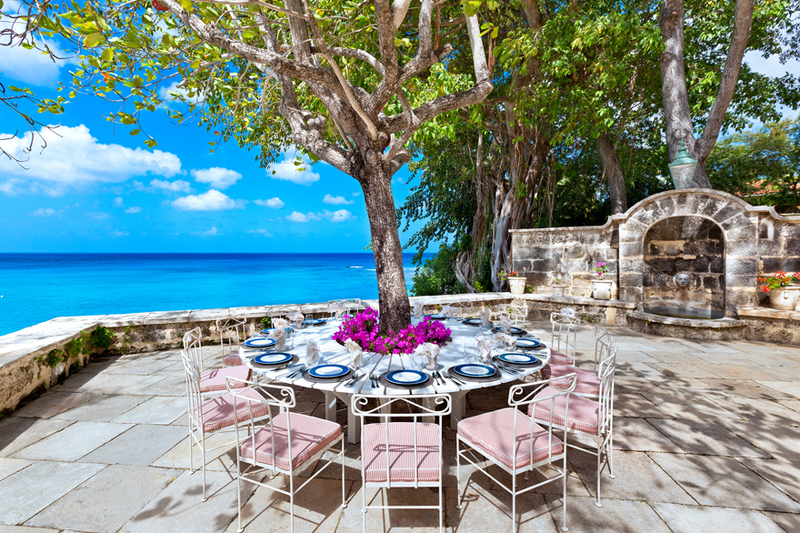 Below the dining portico is a beautiful cliff-top gazebo and barbeque area with a lily pond folly. 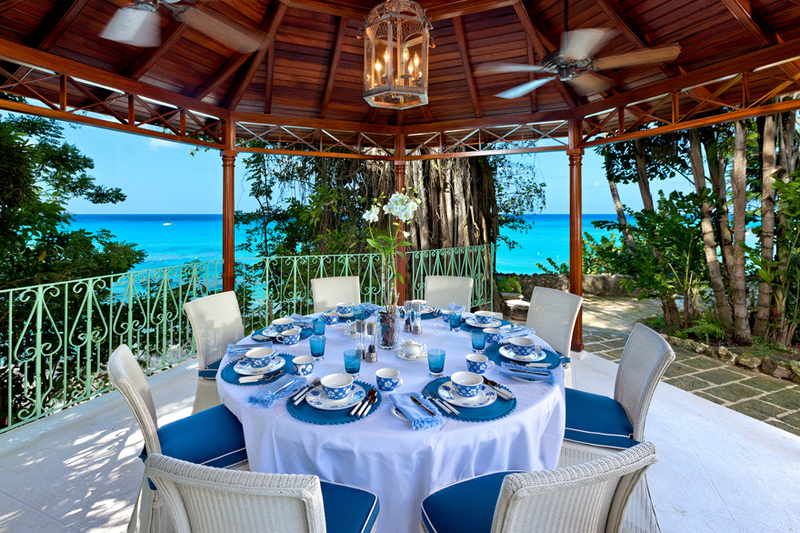 Surrounded by mature tropical foliage and overlooking the sea, the setting is an ideal spot for casual family dining or al fresco entertaining. The gazebo can accommodate up to 16 people comfortably. Adjacent to the Annex is a dining patio with a unique circular table built around an Almond tree that can accommodate up to 20 people. Shaded by oversized umbrellas, the patio is a unique setting for a casual lunch, or can be set with candles for a beautiful sunset meal or cocktail hour. The coral stone terrace features a folly with lily pond, and leads to the pool area, located just above. Based on a pre-consultation, the butler’s pantry is fully stocked with your requested daily necessities, including breakfast items, tea, coffee, snacks, soft drinks, juices, bottled water and a basic bar*. 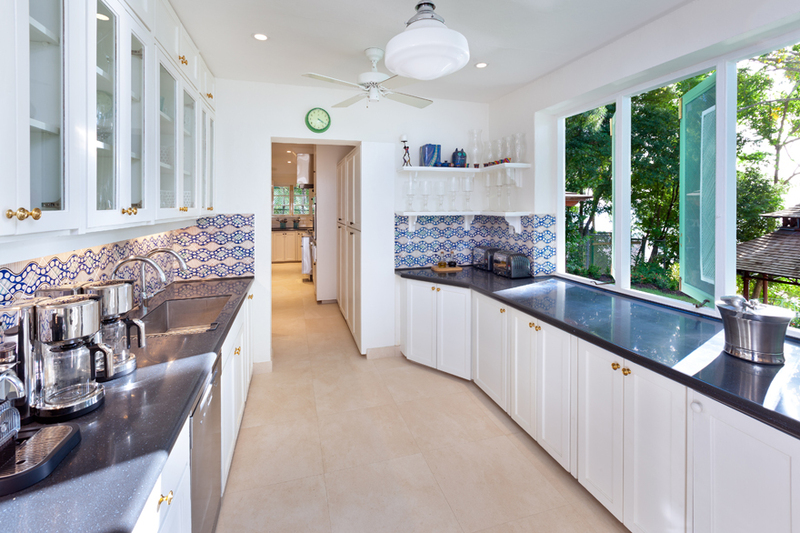 Please help yourself to the pantry which is equipped with a Nespresso machine, coffee makers and tea kettles. *Additional fees apply for pantry stocking. After a long day or night’s travel to reach this idyllic destination, the last thing you need to think about is what’s in the fridge. Our staff will conduct a consultation prior to your arrival and stock your requested necessities for the first few meals; we will also stock the bedrooms with teas, bottled water and other items on request. This will give you a bit of time to settle in and soak up the surroundings, as well as meet with the chefs to discuss the menus they’ll prepare during your stay. Please share with them any allergies, preferences or dislikes, so they can be sure to meet any dietary needs. If there are specific items you require, do let the chefs know and they can make arrangements to stock them for you. We know you will enjoy the wonderful dishes the Crystal Springs kitchen creates using fresh local and imported ingredients; we aim to highlight local flavours with an international flair.